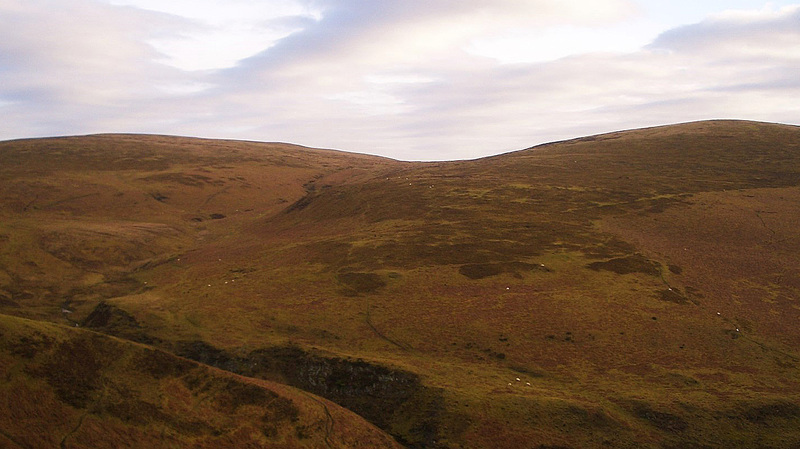 This page has been created to post periodic articles about the continuing place-name research in to the Welsh uplands that Aled Willams and I are conducting. This research started over seven years ago and is ongoing. An article entitled ‘Upland Place-Names in North-East Radnorshire: along the Montgomeryshire Fence’ concerning the place-names found along the border between Montgomeryshire and Radnorshire has been published by the Radnorshire Society, in their annual journal ‘The Transactions of the Radnorshire Society’. 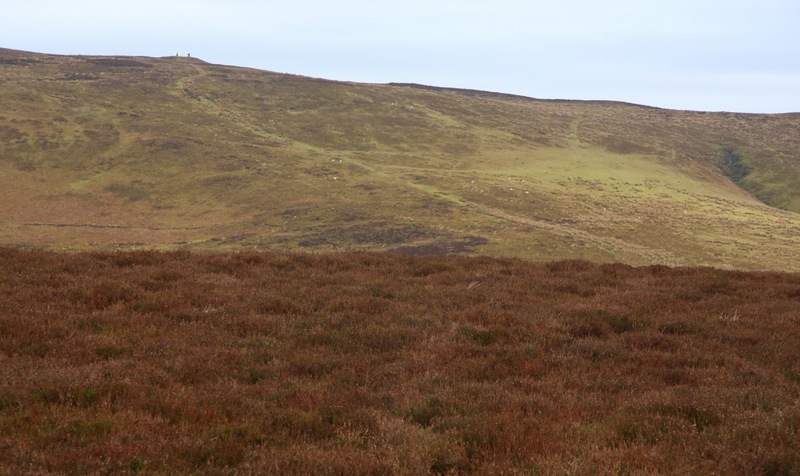 The article is written by Aled Williams and is the culmination of local and historical research he has conducted in the area dominated by Cilfaesty, a 528m high hill recognised by hill walkers as being a Dewey, Uchaf, Dodd, Submarilyn and Hump. The Radnorshire Society was established in 1930 with the intention to document the archaeology and history of the historic county of Radnorshire, which now forms a part of Powys. The Society has an archive and library and organises excursions and public lectures, and as well as the annual journal, the ‘Transactions’, an illustrated newsletter through the Field Section of the Society is also published. The Transactions are published in a bound volume and incorporate academic research and archive material in what is considered to be the county’s pre-eminent scholarly publication. This journal is held in high regard by the scholarly community, as evidenced by volumes 1 - 74 (1931 -2004) having been made freely available via ‘Welsh Journals Online’, a site hosted by the National Library of Wales. As a native of Porthmadog, Aled’s research originally concentrated on his local area of Eryri, but this soon expanded to the whole of Wales. 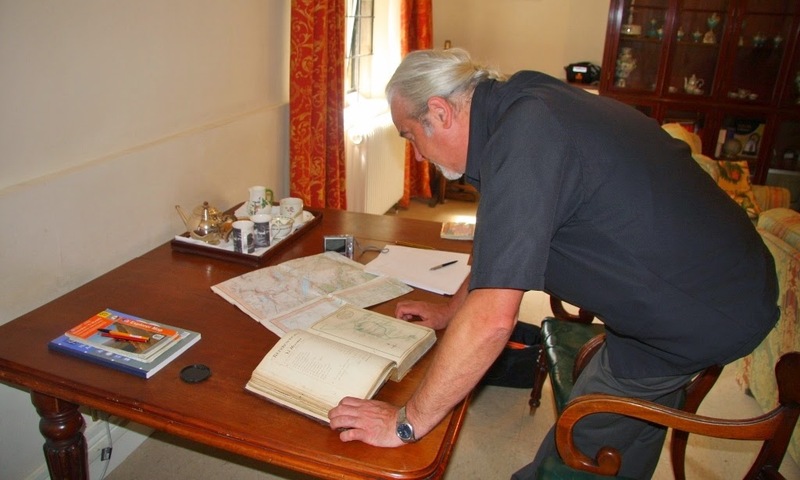 During this research a select few areas received intense research, both on a local level with farmers, landowners, shepherds, gamekeepers, local historians and academics being contacted and on an historical level with Ordnance Survey maps, tithe maps, enclosure maps, estate maps and other historical documents all being analysed and catalogued. Radnorshire holds special interest to a person researching place-names as it is one of the areas that forms the border country with England, and because of this many names have either been anglicised or cymricised. This provides a Welsh speaker like Aled a fascinating task of recording current pronunciations and deducing meanings. 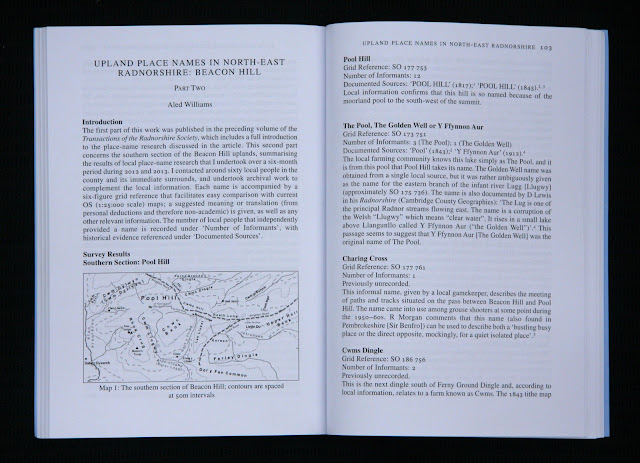 In fact, Aled’s extensive work on the nearby 547m high Radnorshire mountain of Beacon Hill was previously published by the Radnorshire Society in two parts and is also recommended for those with an interest in upland place-names: ‘Upland Place-Names in North-East Radnorshire: Beacon Hill’, with ‘Part 1’ appearing in the 2015 Transactions and ‘Part 2’ in the 2016 Transactions. 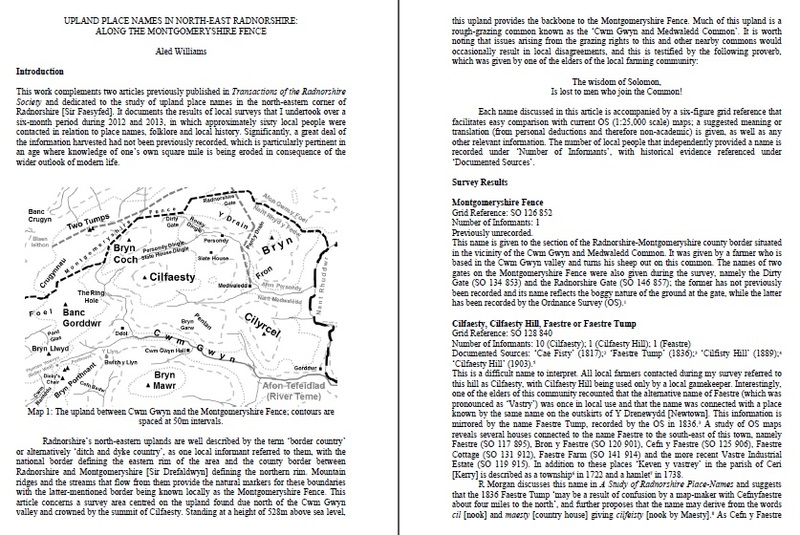 The research is presented with the name, grid reference, number of informants, documented sources and detailed exoplanetary text, with each name and its relevant detail appearing in the same systematic way, and forms a current day comprehensive catalogue of the upland place-names of the area taking in Cilfaesty. 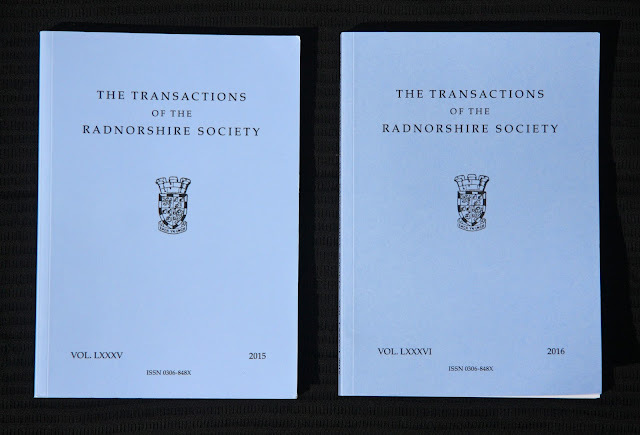 The culmination of a three year study into the upland place-names of north-east Radnorshire has been published by the Radnorshire Society in their annual journal ‘The Transactions of the Radnorshire Society’. The research has been conducted by Aled Williams whose interest in place-names emanated from his hill-walking activities. 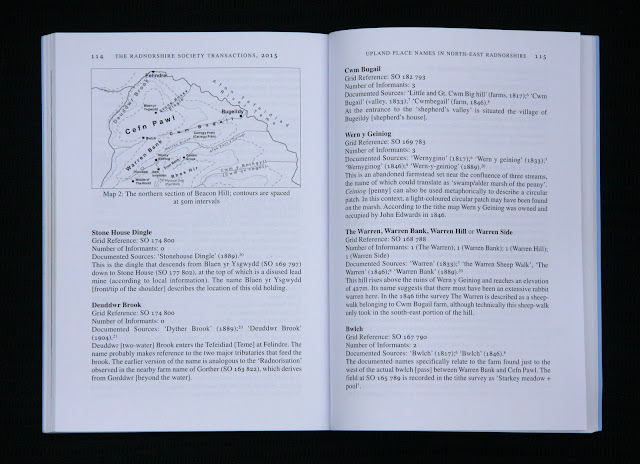 His attention has also been drawn to many of the other upland areas of Wales and its borders, which has enhanced hill list publications such as ‘Y Pedwarau – The 400m Hills of Wales’, ‘The Fours – The 400m Hills of England’ and ‘Y Pellennig – The Remotest Hills of Wales’, all of which are co-authored with Myrddyn Phillips. As a native of Porthmadog, Aled’s research originally concentrated on his local area of Eryri, but this soon expanded to the whole of Wales. During this research a select few areas received intense research, both on a local level with farmers, landowners, shepherds, gamekeepers, local historians and academics being contacted and on an historical level with Ordnance Survey maps, tithe maps, enclosure maps, estate maps and other historical documents all being analysed and catalogued. 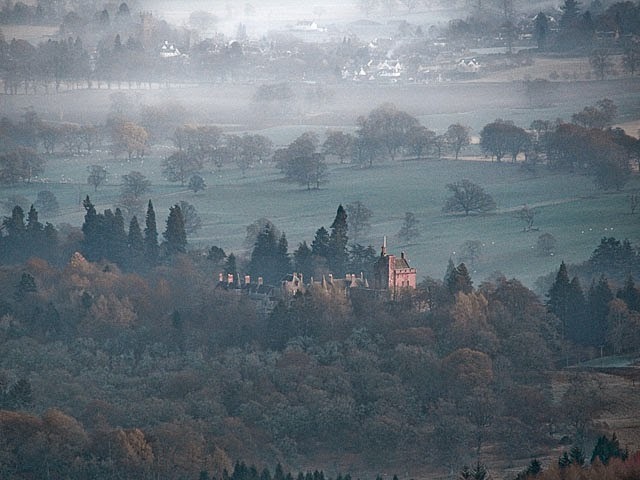 One of these select few areas that Aled has concentrated on has been the hills of Radnorshire, a Welsh county that borders with the English counties of Shropshire and Herefordshire. 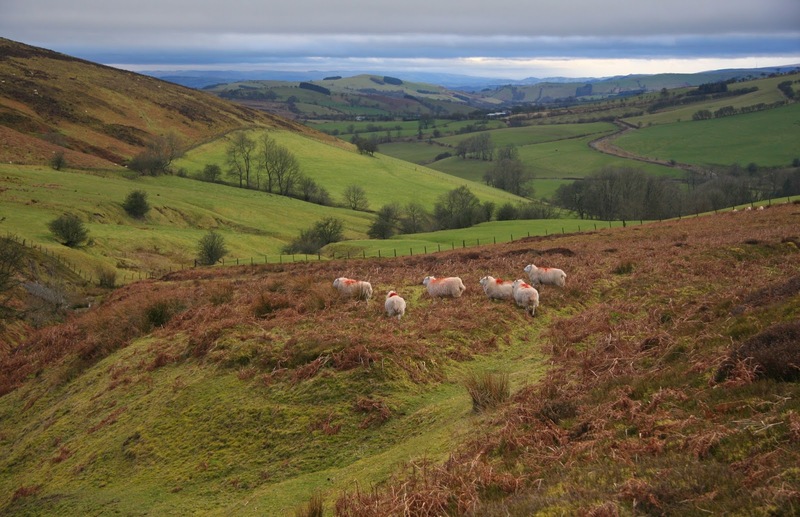 Radnorshire holds interest to a person researching place-names as it is one of the areas that forms the border country with England, because of this many names have either been anglicised or cymricised. This provides a Welsh speaker like Aled a fascinating task of recording current pronunciations and deducing meanings. The articles that the Society has published on Aled’s research are entitled ‘Upland Place-Names in North-East Radnorshire: Beacon Hill’, with ‘Part 1’ appearing in the 2015 Transactions and ‘Part 2’ in the 2016 Transactions. The majority of this blog’s readership will recognise Beacon Hill as a 547m high Marilyn, Hump, Dewey, Uchaf and Twmp. Those with a particular fondness to this hill will find interest in the names published in these journal articles. 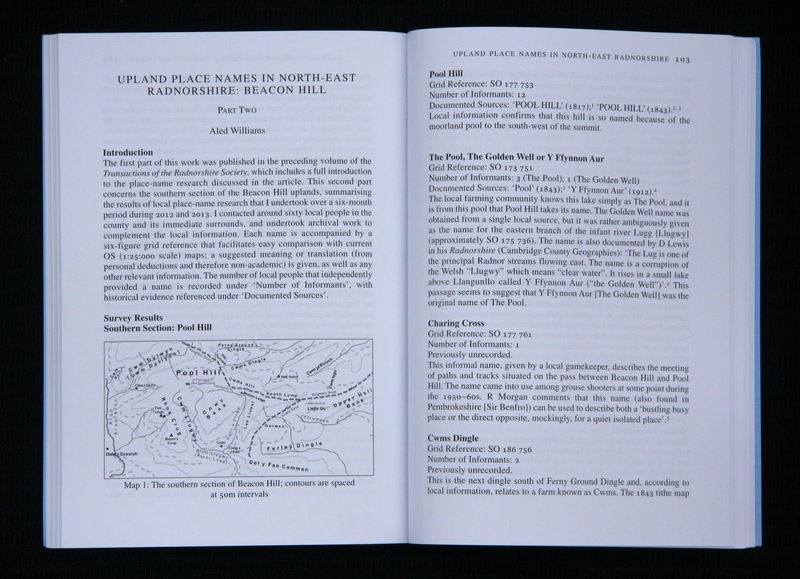 The research is presented with the name, grid reference, number of informants, documented sources and detailed explanatory text, with each name and its relevant detail appearing in the same systematic way, and forms a current day comprehensive catalogue of the upland place-names of the area taking in Beacon Hill. 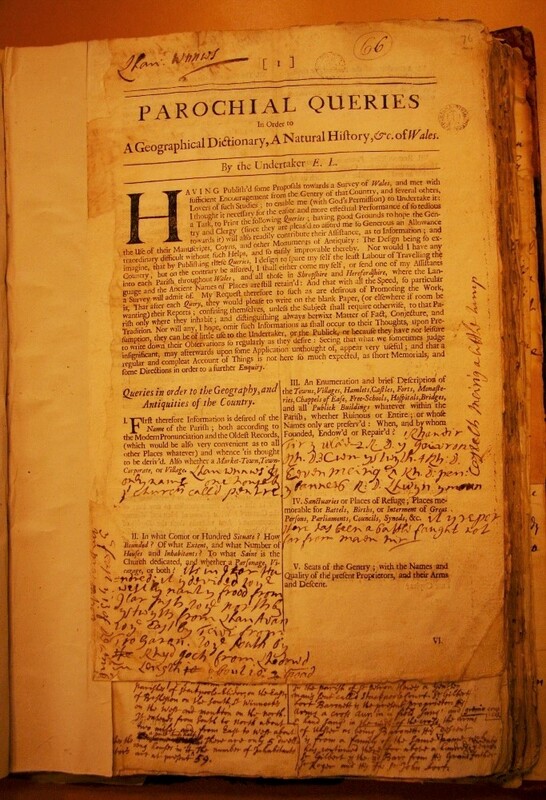 Over three hundred years ago around 4000 questionnaires conceived by Edward Llwyd entitled ‘Parochial Queries in order to a Geographical Dictionary, etc., of Wales’ were printed. In time these ‘Parochial Queries’, or more importantly their returns, would form an intrinsic part of the historical documentation of Welsh upland place names. The research into this historical documentation is similar to a large jigsaw puzzle, with pieces encompassing a variety of sources such as maps, plans, conveyances, books, poetry and manuscripts. The replies to these ‘Parochial Queries’, hereafter referred to as the ‘returns’, are such jigsaw pieces and represent the earliest documentation for some hill names. Edward Llwyd (historically as Lluyd or alternatively Lloyd) was born in 1660 at Loppington, Shropshire, which is a few miles east of the Welsh–English border. He attended Oswestry Grammar School before furthering his educational studies with a move to Jesus College, Oxford, in 1682. 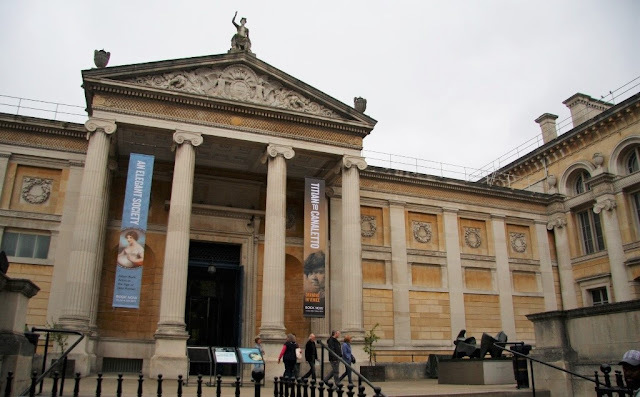 However, by 1684 he had been appointed the Assistant to Robert Plot, the Keeper at the Ashmolean Museum at Oxford, eventually replacing him in 1690. Llwyd’s ‘Parochial Queries’ were a simple but ingenious concept. Each form had a set number of questions on it, split into two parts: ‘Queries in order to the Geography, and Antiquities of the Country’ and ‘Queries toward the Natural History’, with a range of 16 questions relating to the former and 15 questions to the latter. 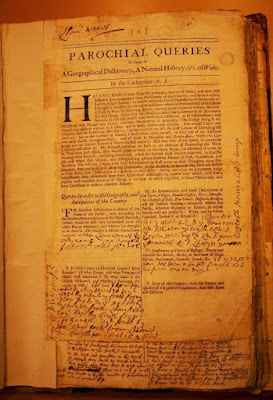 These questions were extensive and will not be detailed in their entirety here, but they range from ‘Seats of the Gentry; with the Names and Quality of the present Proprietors, & their Arms & Descent’ to ‘Manuscripts; of what Subject and Language; in whose Hands; whether ancient or late copies’. 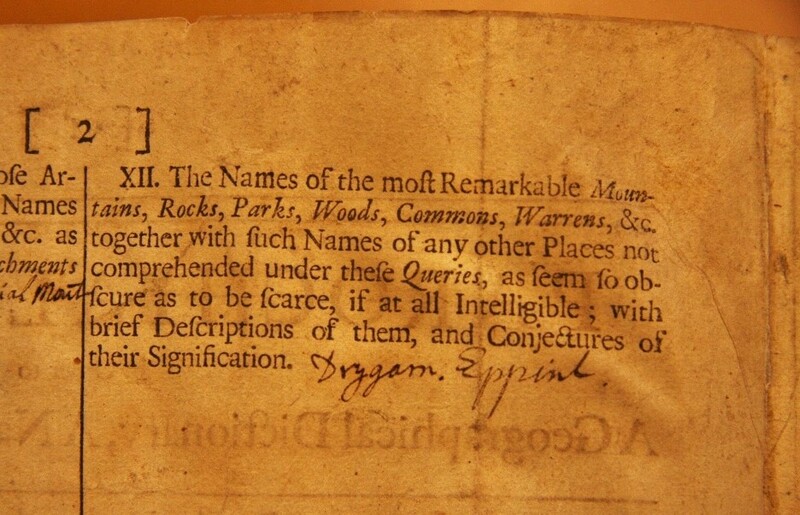 However, the questions that relate directly to this article and the ones that interest us the most were those described as ‘The Names of the most remarkable Mountains, Rocks, Parks, Woods, Commons, Warrens, &e. together with such names of any other Places, not comprehended under these Queries, as seem so obscure as to be scarce, if at all intelligible; with brief Descriptions of them, and Conjectures of their Signification’. Following this question are two others of note; one to ‘The Names of all the Rivers…’, and the second to the ‘Names of the Lakes and Remarkable Springs’. Following each question is a blank space for the reply. The ‘Parochial Queries’ were distributed to each parish in Wales, being sent to the gentry and clergy of the day, for example: ‘About 50 to the parson of Dolgelheu, a parcel to Mr. Price of Wrexham; Mr. J. Davies took with him a good parcel for Anglesey, and about a douzen to the Schoolmaster of Bangor’. Llwyd’s approaches were ahead of their time and his interests have led to his renown as naturalist, geologist, geographer, linguist and antiquary. Amongst his friends were some of the luminaries of the day, including Sir Isaac Newton. One of his legacies is the scientific name for ‘brwynddail y mynydd’ (Snowdon lily); Lloydia serotina (now Gagea serotina). His linguistic interest was centred on the Celtic languages of Britain and Ireland, and his work on ‘Cornish Grammar’ is credited as being a key source in the twentieth century revival of that language. The centuries have not proven kind to Llwyd’s ‘Parochial Queries’ as their returns were sold in lots at auction, with many subsequently lost in two separate fires. Those that survived were compiled and reproduced by Rupert H. Morris in supplements to the journal Archeologia Cambrensis. These three supplements (1909, 1910 and 1911) were later combined in one book entitled ‘Parochialia: being a summary of answers to “Parochial Queries in order to a Geographical Dictionary, etc., of Wales” issued by Edward Lhwyd. Parts I, II and III’. Morris’s compilation has made the analysis of the ‘Parochial Queries’ convenient, however transcriptional errors do exist as well as missing sections of text and in part, it was some of these issues that we wanted to check. 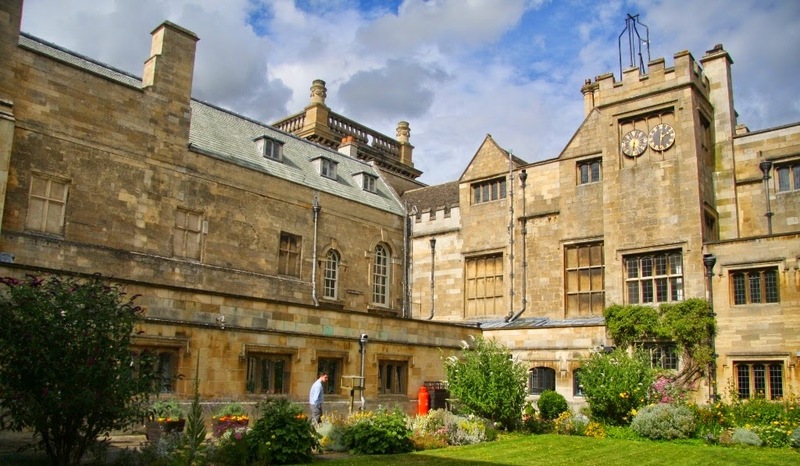 Many of the surviving returns are now housed in the Bodleian Libraries at the University of Oxford. 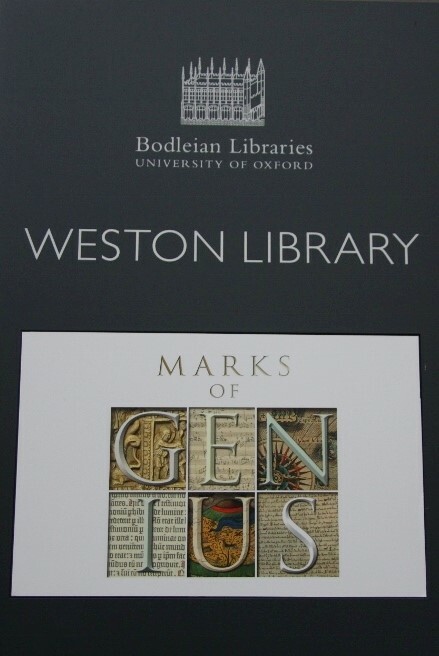 We reserved what was described as a ‘large portfolio’ at the Weston Library and travelled down to Oxford in early September. The Weston Library forms part of the Bodleian Libraries and is housed just off Broad Street in the centre of Oxford. 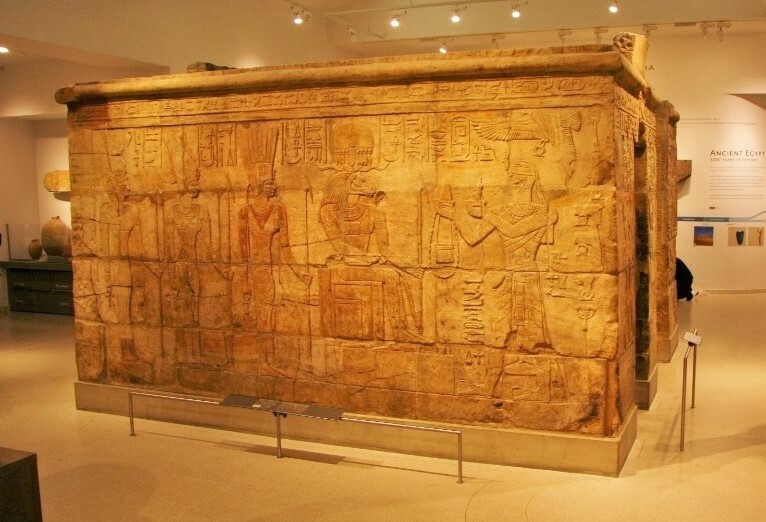 We visited mid-week and with opening hours between 9.00am – 7.00pm our research could be conducted at leisure. After parking and taking the park and ride into the centre of Oxford we treated ourselves to a substantial breakfast, and were applying for our Reader’s Ticket at 9.45am with our proofs of identity and our filled-in forms detailing our reason for visiting. Once complete we dropped off our bags in the lockers and walked up to the first floor, where the Reader’s Room is situated and where our ‘large portfolio’ awaited. This ‘large portfolio’ was housed in a box containing an old leather-bound manuscript with ‘E. Lhuyd’s Parochial Queries and Miscell Papers. Letters to Whiteside’ printed on its spine. We had found our quarry. The Reader’s Room at the Weston Library is similar to most large research centres and has a variety of resources at hand, including a full range of Ordnance Survey maps and a wealth of reference books. 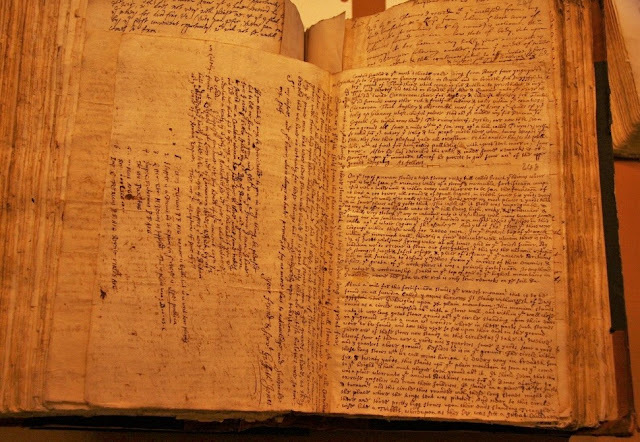 We chose our table and placed the portfolio on it, its contents proved a joy to behold as within the manuscript were some of the original returns to Llwyd’s ‘Parochial Queries’. These papers are now almost 320 years old and their contents are of national importance, preserving priceless information useful to a variety of subjects. Although we knew that we had sufficient time for the day’s research we still had many things to examine, thankfully the Weston Library allows photography (without the use of flash) and free of charge; this is welcome as many research centres charge for this privilege. One by one I turned the pages as Aled photographed each in turn. At the start it took a while for us to accustom ourselves with the layout of the manuscript as the majority of its contents were letters on different subjects. Only occasionally would a return present itself, but when they did we poured over the detail. One of the delights of upland place-name research is finding a name that has been documented in a source outside of the Ordnance Survey as these instances represent name validation, which often occurs when making local enquiries. The returns we were examining were fascinating, and it was remarkable to see hill names that appear on maps written 100-150 years prior to the surveys conducted by the Ordnance Survey. Two such names were the mountains documented as ‘Drygarn’ and ‘Eppint’. We quickly realised that the contents within the manuscript did not fully compliment those within Morris’s book and therefore we asked the staff if the Bodleian Libraries housed other material relating to Edward Llwyd. 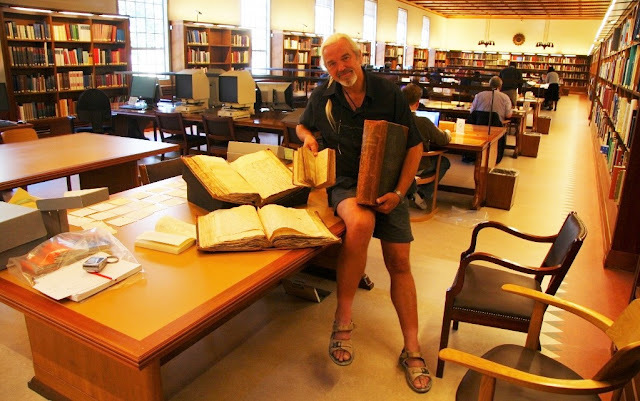 This process can be difficult when references are obscure, but fortunately the librarians managed to locate two further portfolios relating to Llwyd. As it would take approximately two hours for them to become available, we decided to take a dinner break followed by a quick visit to the Ashmolean Museum to look at their excellent Egyptian collection. By the time we had returned to the Reader’s Room in the Weston Library it was only a few minutes before the first of the two additional portfolios was delivered. 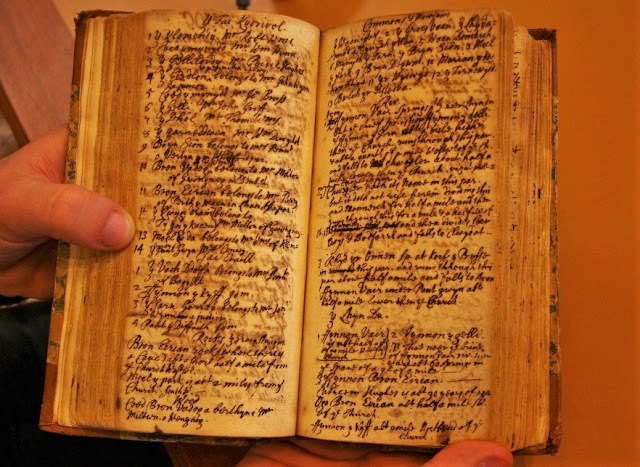 This consisted of three large leather-bound manuscripts, each seemingly thicker than the last. These again proved a delight to look through as they transported the reader back to a time when letters were signed ‘faithfully your servant…’ These books also housed ‘Parochial Queries’. The second part of the additional material was soon delivered to us in the form of a much smaller notebook. Morris mentions this and states that this ‘copy, though contemporary, does not appear to be in Edward Lhwyd’s handwriting, but there are several corrections made in process of writing, as will be noticed in our transcript’. Morris’s transcription of this notebook is quite faithful, meaning that the missing text and errors from this source predominate from the original transcription. With two of Morris’s sources now examined in their original form we are keen to analyse the rest. However, these could be housed in either another one of the Bodleian Libraries or at the National Library of Wales, therefore it will take further research before our examination of Edward Llwyd’s ‘Parochial Queries’ for upland place names is complete. Seventy-four years ago the final brush strokes were being added to a portrait of a six year old girl. Once finished, the portrait was framed and in time hung on a wall, the penultimate portrait of many, all neatly arranged on opposite walls of a long corridor. Many of the other portraits comprised images of formal sittings, oil on canvass predominated, with an artist’s skill the many faces of aristocracy were forever captured, one beside another, all either ancestors of the six year old girl, or monarchs of the day whose association was direct to her family. The young girl was born Nancy Jane Marie Heathcote-Drummond-Willoughby, she is the 28th Baroness Willoughby de Eresby and is a joint hereditary Lord Great Chamberlain and sat in the House of Lords as a crossbencher. When in company she is referred to as Lady Jane or Lady Willoughby. Upon the death of her father in 1983 the Earldom of Ancaster became extinct and she inherited 75,000 acres of land in Lincolnshire and Perthshire, the former includes the stately house of Grimsthorpe Castle and its grounds, whilst the latter comprises Drummond Castle and its acreage. Both Castles are periodically resided in by Lady Willoughby. 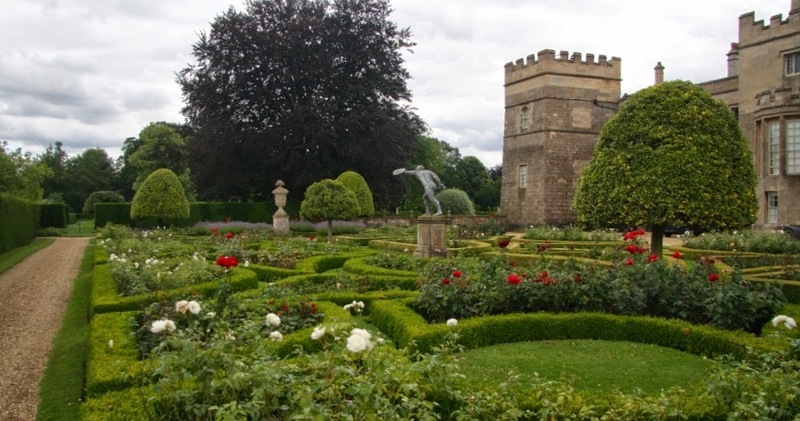 Grimsthorpe Castle is placed in a 3,000 acre park comprising lakes, woodland, pastures and ornamental and working garden, some of which was designed by Lancelot ‘Capability’ Brown and implemented by his patron; the 3rd Duke of Ancaster. In the true sense of the word the building is not a castle as castellated architecture was later added which bestowed its current title. The building is more a stately home, grand in nature and has been the home of the de Eresby family since 1516. As well as the grandeur of Grimsthorpe and Drummond Castles the family also own lands in north Wales, this is the Gwydir Estate. 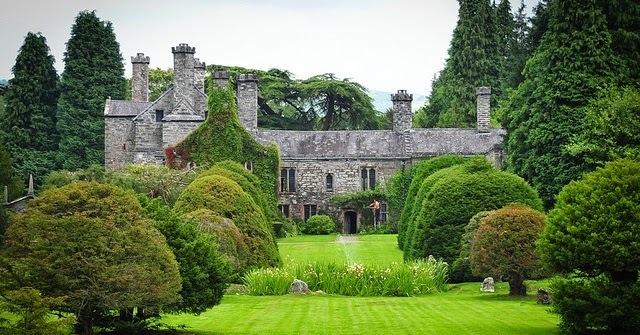 The de Eresby lands in north Wales were centred on Gwydir Castle (this building is no longer owned by the family and is now a private residence) and is situated just to the west of Llanrwst and just south of Trefriw in the Conwy valley on the edge of Snowdonia. The building is an example of a fortified manor house or courtyard house built in the traditional Tudor architecture. Gwydir became the ancestral home of the Wynn family who were descended from the Kings of Gwynedd, and became one of the largest landowning families in north Wales and are related to the de Eresby family through marriage. During the 16th and 17th centuries when the Wynn family managed the Gwydir Estate the house stood in a deer park comprising 36,000 acres. In 1678 the Estate was passed to the Barons Willoughby de Eresby, who were based in Lincolnshire, and then from 1892 to the Earls of Ancaster. Part of the Estate comprised lands in the Parishes of Dolwyddelan, Llanrhychwyn and Llanrwst. Much of this land was mountainous, with lower ffridd pasture usually bounded to tenant farms and higher, open mynydd land considered poor quality for grazing. This higher mynydd land comprised the ancient cynefin, or sheep-walk in English, this is the land granted to tenant farms on the basis of grazing rights, which are established through boundary fences, walls or watersheds. Each patch of land, be it fields, ffridd or mynydd is given a name, and sometimes the names to ffridd and mynydd lands relate to the tenant farms, for example, if the farm of Bryn Coch had grazing rights on bounded mountain land, the patch of land (cynefin) would be known as Mynydd Bryn Coch. This naming by association to farm name is an ancient practice in Wales, and one that is still used today. In the 18th and 19th century the Gwydir Estate and Castle suffered some years of neglect and went in to a long decline. This was partly based on income, or lack of, from the 30 slate mines on the land, this slate was of poor quality and output was not high, this culminated in 1894 with the sale of the Dolwyddelan lands, followed in the next two years by most of the Estate lands of Llanrhychwyn and Trefriw. In the early part of the 20th century the 1640s panelled main dining room was totally stripped and in 1922 the Solar Tower was gutted by fire. In 1921 the Earl of Carrington sold the house, this was the first time in over 400 years that it had been passed out of inherited ownership. The current private owners have rejuvenated Gwydir Castle and have restored the original 1640s panels in the main dining room and are undergoing a programme of conservation. It was inherent for many Estates to document their land, tenants and rents, this usually took the form of an Estate Survey, each detail would be meticulously catalogued in an Estate Survey Book, and usually leather bound these books would form a document of the day and in time become a priceless tool for research. 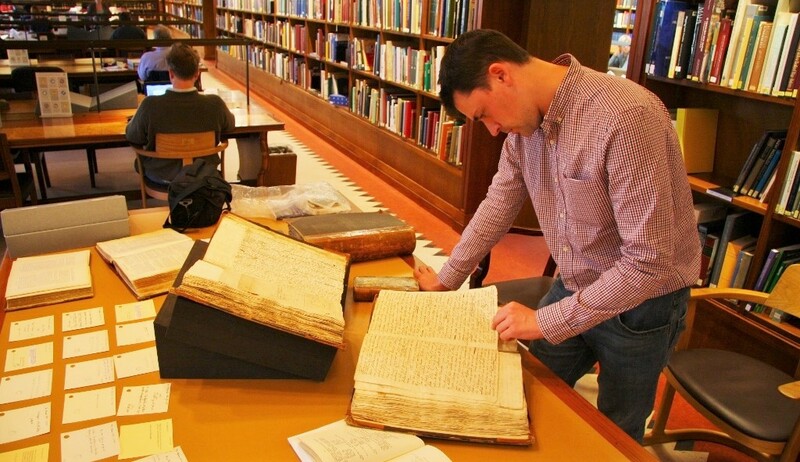 Many Estate Survey Books are housed in archive centres where access to their treasures is open to the public; others are held in the private archive of the Estate. Usually within their parched pages are many maps showing the fields, ffridd and mynydd lands of each tenant farm. Lines across the map would indicate boundaries and letters within the boundary could be cross referenced to an adjacent page where detail of farm, residents and rents were sometimes documented. 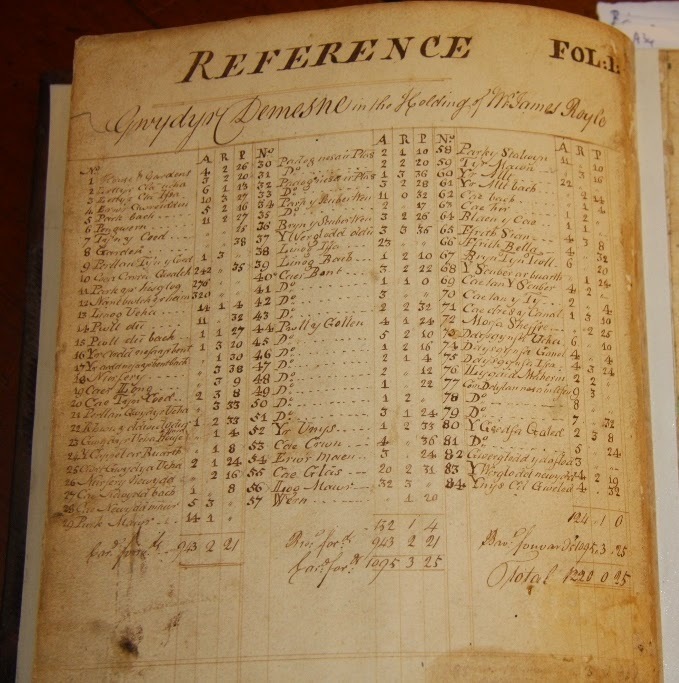 Many Estate Survey Books were produced in the late 1790s, before the Ordnance Survey was established as the map makers of the day, and because of this they are a historical document of a bygone time. 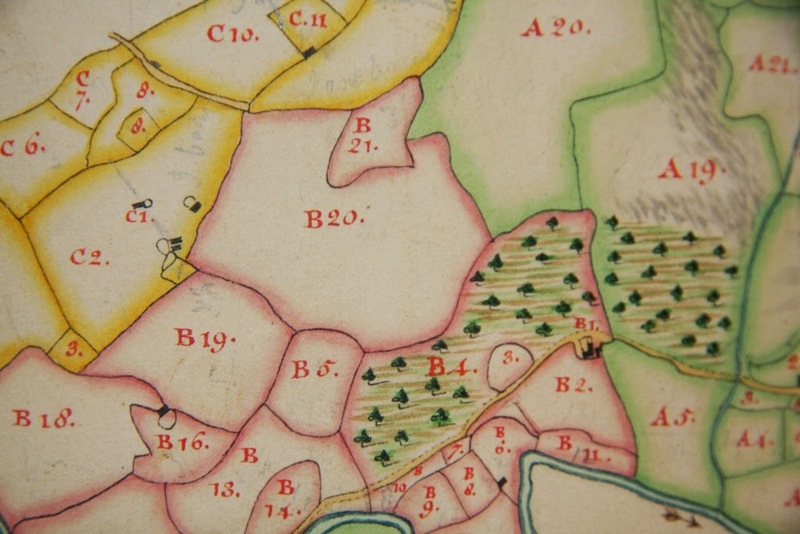 However, their importance is not to be undervalued as they form a bridge between the late 1790s through the early publicly available maps produced by the Ordnance Survey to nowadays when research can be conducted via local inquiries and the Internet. Occasionally accessing these old Estate Survey Maps can confirm a name previously given through local inquiry or one that has never been documented on any Ordnance Survey map. As well as being a conduit between times after Edward Llwyd and those of the Internet, these old books are a literal work of art, with many maps being composed in watercolour paint, intricate detail of lake, field boundary and parish with different colour used to signify different boundaries; they are a joy to behold. It was our continuing research in to Welsh upland place names that led Aled and I to the private archive of Lady Willoughby at Grimsthorpe Castle. This enquiry had originated from research that Aled had conducted at the Caernarfon Archive Centre. Some of his visits to this archive were based on research concerning the lands of the Gwydir Estate. Through research via the Internet he found a reference to an Estate Survey document whose reference number comprised the initials ‘ANC’, this refers to the Earldom of Ancaster, the now extinct title inherited by the male line of the de Esesby family. Aled found that this document was housed at the Lincolnshire Archive; he asked if I could make enquiry to its whereabouts and arrange for it to be viewed by us. Thus began the journey we were about to undertake…. 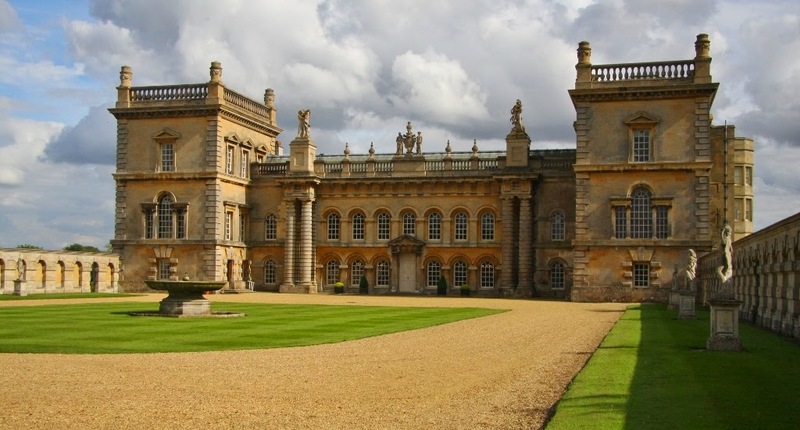 I phoned the Lincolnshire Archives and was told that the document had been there since the 1970s, but had been taken back in to the private archive of Lady Willoughby at Grimsthorpe Castle in 1991. They kindly gave me a forwarding contact at the Castle’s Estate Office. I initially spoke to someone called Helen who explained that the Castle was busy in preparation to welcome the BBC’s Bargain Hunt team for filming over the upcoming weekend and asked if I could call back a few days later and speak to Ray Biggs. When I contacted Ray he proved very helpful and suggested I should put my request in writing and send the letter to Lady Willoughby, as she usually takes an interest in such enquiries. I thanked Ray and left him my contact details and the reference number that Aled had found for the document. 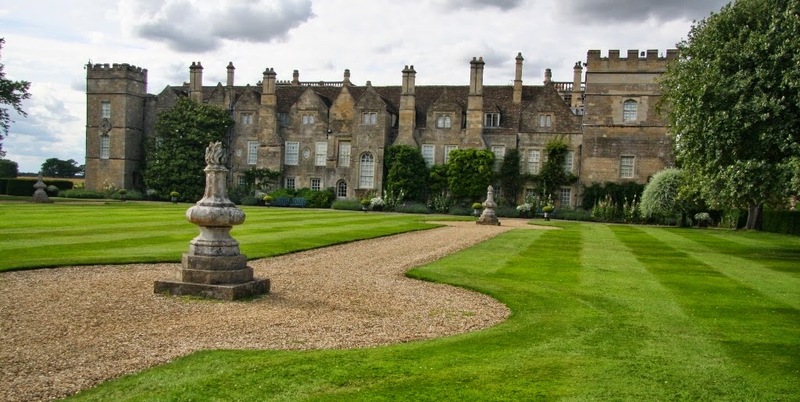 Later that same day I received an email that informed me that Lady Willoughby had found the document (book) and had invited us to visit Grimsthorpe Castle to view it. I forwarded the email to Aled and our levels of expectation and excitement started to spiral out of control! Soon afterwards I received a phone call, “hello” I answered as I picked the receiver up, “hello it’s Jane Willoughby” the voice on the other end gently announced. We talked for ten minutes or so with Lady Willoughby describing the contents of the Estate Survey Book and inviting us both to lunch, I thanked her for finding the book and also for inviting us to visit. Aled and I left Welshpool at 6.30am in early morning sunshine and arrived in the fertile lands of Lincolnshire at around 9.30am. Our first view of Grimsthorpe Castle was from its main entrance gate, with a straight drive stretching out toward a resplendent symmetrical stately house with manicured lawns either side of the drive. The view was made to impress and we were not disappointed. We drove to a side entrance and introduced ourselves at the Estate Office, where they were expecting us. We then bade our good mornings at the security gate and were directed toward the Castle. With blue skies and summer warmth the whole place had a feeling of a lazy day in the surrounds of a French country Château. Once the car was parked we walked past ornamental landscaped gardens to the side of the Castle and rung a doorbell. Soon we had been greeted and were in a side room where the Estate Survey Book had been laid on a table. We introduced ourselves to Lady Willoughby who proved a delight to converse with. Soon afterwards Lady Willoughby excused herself and left us to our work. 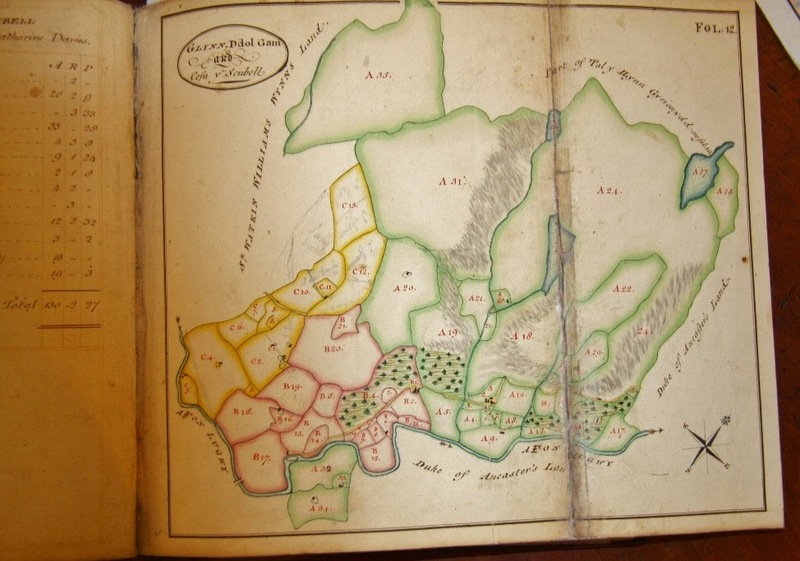 The Estate Survey book is entitled ‘Book of Maps no 86’ and takes in the lands to the Gwydir Estate. Each map is a small work of art in its own right with detail giving each land boundary highlighted in water colour. The majority of maps are to the lowlands, and although all were of interest we wanted to examine two or three specific areas to the mountains of the south-eastern Carneddau and areas around the Moelwynion. The first had proved extremely interesting from local place-name inquiries, whilst the latter was proving problematic for a particular set of closely grouped hills. Each page within the book was slowly opened to show another page of neatly written detail with an accompanying map, many of these were folded as they were larger than the dimensions of the book. Lakes were edged in blue with pinks, yellows and greens used to edge and signify boundaries, trees as green symbols, almost heart shaped in appearance with an underlying green, mountains as pencilled hummocks, many stretching the length of a boundary. All had been skilfully crafted and meticulously drawn. This book is over 215 years old and its contents a prized opportunity for those interested in place-name research. During our prolonged map gazing the security man asked us if we would like to be shown around the Castle on one of the conducted tours, we thanked him and said yes, he booked us in for 3.00pm. By the time we had digested the book’s contents it was time for lunch. We were led to a large rectangular room where a long table had been set for five people. Lady Willoughby soon arrived and sat at head of table, whilst opposite Aled and I sat two furniture repairers who were working on chairs during the week. Conversation flowed and centred on our research, the history of the house and the region it was built in, as well as that of Drummond Castle. The first course consisted of artichoke harvested at the Scottish Estate with accompanying hollandaise sauce, the main course was ushered in after a ringing of a bell signified that plates could be collected, once a tasty fish cake, peas and beans and new potatoes had been finished we had dessert which consisted of fresh raspberries from the working garden and cream. After coffee we thanked our host and walked back to the room where the Estate Survey Book remained firmly placed on its table. As 3.00pm approached we were led around the side of the Castle and introduced to the guide who would take us and another four people around the part of the house that is open to the public. It was fascinating to have been in the company of Lady Willoughby and see the behind the scenes running of the house and be in contact with its occupants and then join a guided tour, full of history and anecdote whilst being led from one ornate room to another with a plethora of priceless artefact and painting, all grandly displayed. I wondered what the emotional impact must have been through the economical realisation that a house, however grand, that had been in a family’s possession for so many centuries would have to be made accessible to the public for its financial upkeep to carry on. This was not something I raised on the day but the question partly intrigues me. We were shown the Vanbrugh Hall, the State Dining Room, the King James Room, the State Drawing Room, the South and west Corridor, the Gothic and Tapestry Bedrooms and the Chapel. As we neared the end of the tour we were led down another long corridor with bedrooms to our left where Prince Charles and Camilla Duchess of Cornwall had recently stayed, both walls were awash with skilfully crafted portraits, many of Kings and Queens and titled ancestors. I looked up at the penultimate portrait, that of a young girl, a very different style from all those preceding it. From memory the girl’s eyes were looking slightly downward in a shy manner, even then her face portrayed a beauty that would remain with her until later years. 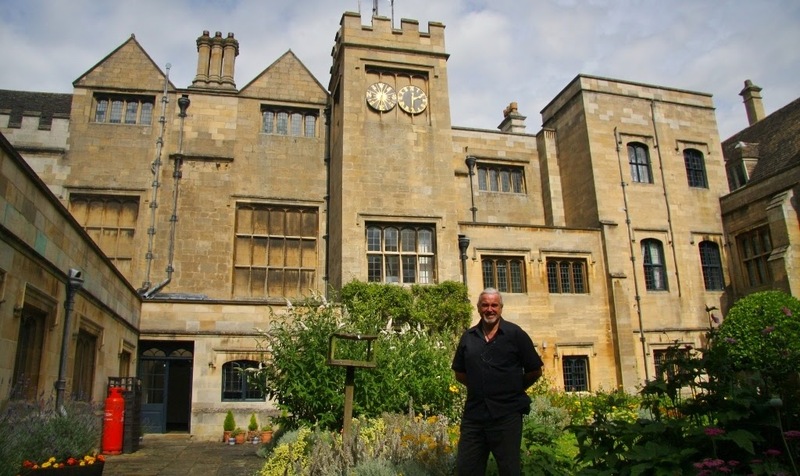 As the tour ended we thanked our guide and headed back in to the private quarters of Lady Willoughby and spent 30 minutes in the inner courtyard, taking photographs as the sun broke through the afternoon’s cloud. After this we headed outside to spend time walking around and photographing the front and rear of the Castle, taking time to look out over the pool and park land that stretched westward toward the horizon. Before going back in to the Castle we roamed around the gardens admiring the beauty of symmetrical pattern and watching a mouse as it positioned itself up a raspberry vine to nibble away at its contents. After ringing the doorbell to gain access back in to the Castle we were invited to join Lady Willoughby in the Library to partake in afternoon tea. We were again joined by the two furniture repairers, whose names I unfortunately did not note. Tea was poured, conversation was had and everyone seemed to enjoy the buttered Welsh cakes we had brought Lady Willoughby, along with a baked Bara Brith, which was a small gift on our part for the kindness she had shown by inviting us in to her home. We left at 5.50pm refreshed in the knowledge that kindness is a part of the human spirit and gratitude expressed can take many forms, ours was partly through our small gift. 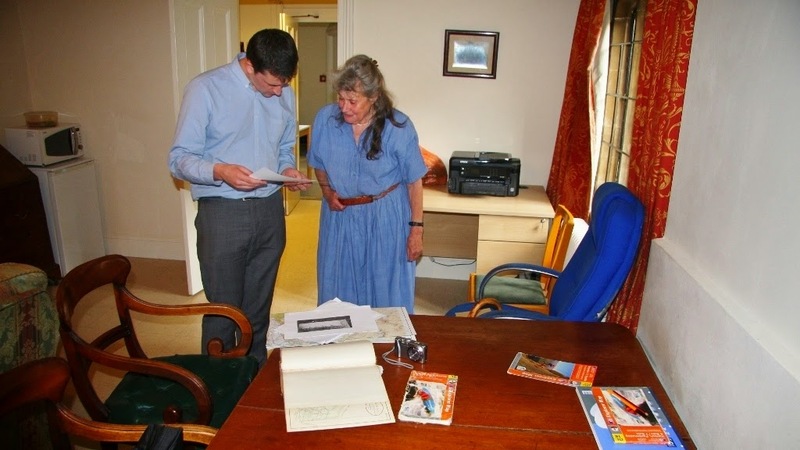 The opportunity to view such a document as the Estate Survey Book and to do so in the surrounds of Grimsthorpe Castle in the company of Lady Willoughby is an experience that will no doubt live with us for many years to come.